Luke is an academic and political activist based in Cork, and a member of Rebels4Choice, the Cork branch of the Abortion Rights Campaign. Here he shares his reasons for travelling to #ARCMarch18 tomorrow. The 7th Annual March for Choice starts at 2pm on Saturday from the Garden of Remembrance, Dublin. With the 8th Amendment officially deleted from our Constitution at last, we finally have an opportunity to deliver the free, safe, and legally accessible abortion provision that Ireland deserves. However, until we secure appropriate legislation, nothing is a guarantee. I’m marching this year because I know that we need to keep this issue in the public eye, so that there will be no backsliding on the necessary elements of the law. There will always be other issues that compete for attention, and in the wake of a successful referendum result, there is every chance that those in the media and professional politics will turn their gaze away from this issue. We can stop that from happening by staying active, loud, and visible. As a man, I have a responsibility to use my privilege in the assistance of women, girls, and anyone who can become pregnant. 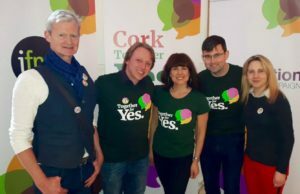 I would ask the men who rowed in behind the Yes campaign to maintain their active solidarity and be a part of the campaign for legislation. The public is on our side, and our experience to date would show that every decision-maker – from voter to legislator to medical practitioner – can be convinced of the need for robust abortion provision when given enough evidence. All we need is to keep pushing for the right answer. We’ve come a long way, but we have further still to go until everyone in Ireland who needs an abortion can access it freely, safely, legally, and locally. I’m going to keep marching until we get there. Thank you for your support; also for the info I came to site looking for: time of march start tomorrow!